Assumption is the only Catholic high school in Louisville to offer the prestigious AP Capstone Program. AP Capstone is a College Board program that equips students with the independent research, collaborative teamwork, and communication skills that are increasingly valued by colleges and employers. It cultivates curious, independent, and collaborative scholars and prepares them to make logical, evidence-based decisions. AP Capstone is comprised of two AP courses — AP Seminar and AP Research — and is designed to complement and enhance the discipline-specific study in other AP courses. Assumption High School will use the AP Capstone program to provide unique research opportunities for current AP students and to expand access to AP by encouraging students to master the argument-based writing skills. The AP Capstone Diploma program allows students to create the academic focus that is most meaningful for them and provides a forum for students to explore their areas of interest in a rigorous classroom environment which expects college-level outcomes in their research. Taught by faculty member Colleen Murphy, AP Seminar students have the opportunity to work collaboratively to develop critical thinking skills. 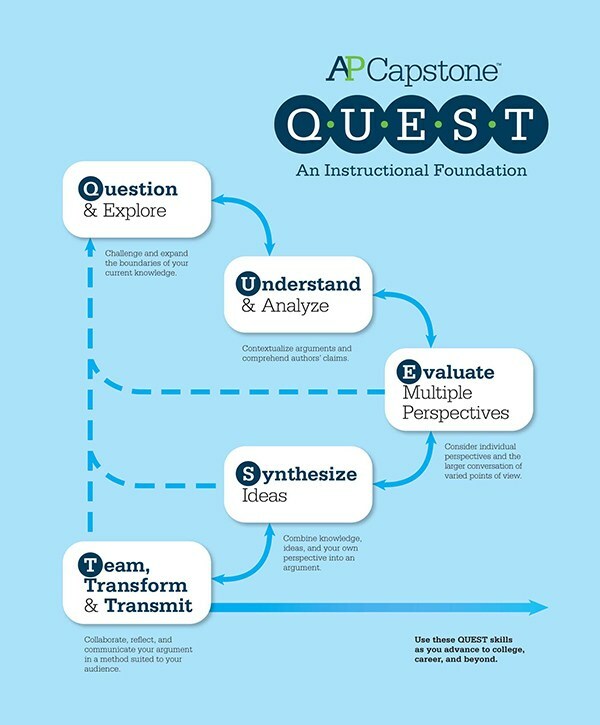 AP Capstone gives students the following pedagogical framework (“QUEST”) to develop, practice, and hone their critical and creative thinking skills as they make connections between various issues and their own lives: Question and Explore.